A bone chapel or 'ossuary' in central Milan, Italy – with masses of human skulls and femurs stacked high up on the four walls. Some ornamentation has been made out of bones too. Well worth the little detour. More background info: The bone chapel is part of, or rather directly adjacent to, the church of the same name, the Roman Catholic Chiesa di San Bernardino. The origins of the church and its bone chapel date back to the 12th century when bones from a cemetery in front of the neighbouring Basilica di Santo Stefano Maggiore were first stored in a chamber at the site. San Bernardino church was first built next to it in the 13th century. The artistic arrangement of bones and skulls, however, wasn't undertaken until much later and had to be rebuilt in the later half of the 17th century, after the bell tower of the Santo Stefano basilica next door collapsed onto its neighbour in 1642 and destroyed it. The church and chapel's exterior in its present form wasn't finished until 1776. 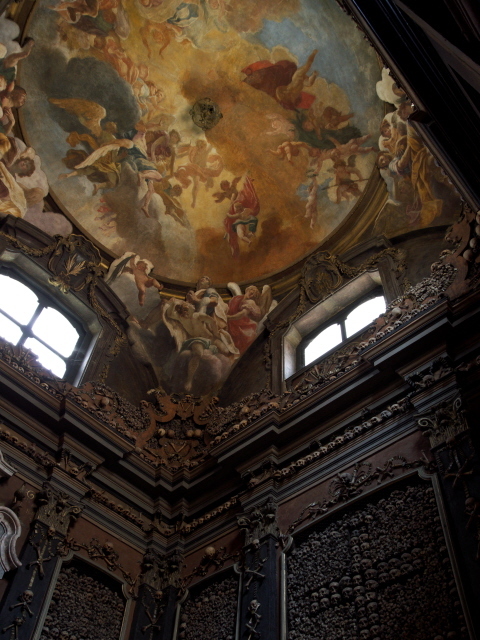 The large ceiling fresco of the bone chapel dates back to 1695 and was executed by the late Baroque artist Sebastiano Ricci. It is said that the Evora bone chapel in Portugal was modelled on San Bernardino alle Ossa, after the then king of Portugal had visited it and apparently was mightily impressed. According to one of those legends that places like this appear to attract (they do stir the imagination, it seems) the bones of a little girl come back to life every All Souls Day (2 November) and leads all of the other dead in the ossuary into a danse macabre. Today, the ossuary may be a little quirky attraction for tourists with a taste for off-the-beaten-track sites, and as such it is featured in specialist guided tours of Milan as well. Yet it is surprisingly popular. TripAdvisor had it at No. 51 of nearly 900 listed “things to do in Milan” when I last looked, in May 2015. That's really quite high for such a non-mainstream sight! What there is to see: Once you've found the narrow little passageway to the right of main church proper (not difficult, it is well signposted), you enter a much darker place. Darker both in the literal sense (compared to the whitewashed walls of the main church) but of course also figuratively, metaphorically. It doesn't take long to realize that the walls' are covered almost floor to ceiling in stacks of human bones and skulls. The stacks are framed like oversized paintings and form simple shapes – such as a cross of skulls embedded in a wall of stacked femurs. 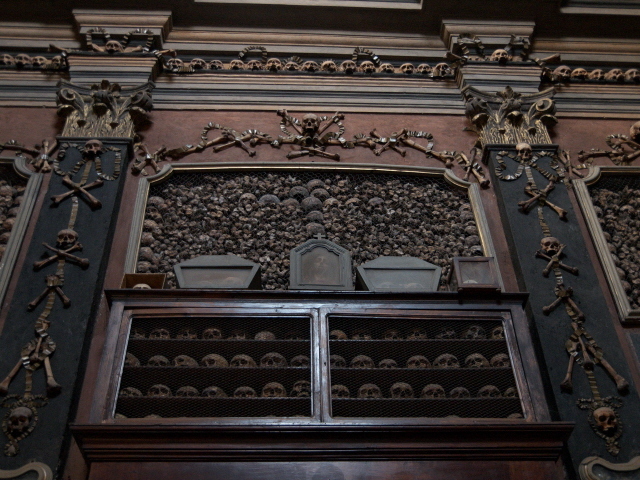 In between the “frames” single and small groups of bones and skulls are arranged to from ornamental patterns (the classic skull and crossbones theme appears frequently). Skulls also line the ledge between the walls and the windows and ceiling. At the bottom, from floor level to about 1.5m high are further niches containing skulls that you can thus approach very closely. Eye to eye, nose to nose, as it were. The very Baroque ceiling fresco, in its typical colourful flamboyancy, contrasts oddly with all the grimness of the human remains. Next to the small altar of sorts, a single vase with red flowers provided another speck of bright colour contrasting with the bone stacks. A small table with candles stands nearby, so you can light one in honour of the many dead around you. When I visited the bone chapel (in late April 2015), I was far from the only visitor. Most of the ca. two dozen other tourists that came in and went while I was there were clearly just there to “tick it off” and snap a picture or two – many were Asians (Koreans or Japanese I guessed). Only one Italian-speaking couple also took their time and examined all the details at great length. So it wasn't just me. 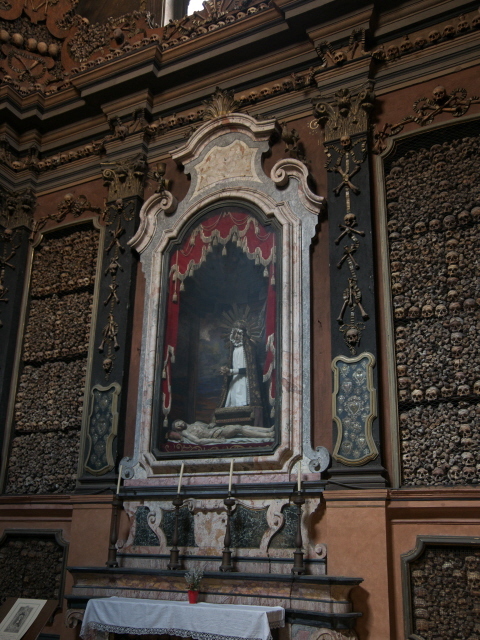 The bone chapel of San Bernardino alle Ossa may not be on a par with the extreme artistic bone arrangements at the Czech Sedlec ossuary, nor can it compete in terms of spooky grimness with the Capuchin Crypt in Rome or the one in Palermo, but it is certainly worth a look when in Milan. Location: almost right in the centre of Milan, just a couple of blocks south-east of the Duomo(cathedral), on Piazza Santo Stefano, just south of Via Verziere. Access and costs: just a little off the main tourist drags around the Duomo, but not too tricky to find; free/small donation expected. Details: To get to the bone chapel you can walk it from the Duomo (where you will at one point or other be anyway when visiting Milan). Just proceed along the cathedral's southern side to the end of the square and into Via dell'Arcivescovado. This leads into Piazza Fontana. Cross this diagonally, leaving the Municipal Police building on your left and then cross the wide avenue of Via Verziere. You'll already see the dome of the church from across the road. The entrance to the church and the bone chapel is at the rear, on Piazza Santo Stefano, just to the left of the larger Basilica di S. Stefano Maggiore. Once inside the church turn right to get to the narrow corridor linking the church and the bone chapel. Two signs saying “ossario” make it easy to find. As you follow those signs you'll also pass one that asks you to leave a donation. The suggested sum is a meagre 0.50 EUR, so even though nobody will be there to take it from you, you could just as well have the honesty and generosity to drop the coin (or a bit more) into the box provided. Opening times: the details provided by the sign on the door and by the info panel outside (put up by the Milan Tourist Office) deviate slightly from one another. The sign says open daily, from 8 a.m. to 12 noon and from 1:30 to 6 p.m. on weekdays, and only from 9:30 a.m. to 12:30 at weekends. The tourist info says closed on Sundays and brings the morning and post-lunch opening times forward by half an hour. Best go during the times both sources overlap on. Interestingly, Mass is read not only in Italian here, a sign also says that on Sundays there's Mass also in Korean, at 11 a.m., and Sri Lankan (that must mean: Sinhalese), at 5:30 p.m.! Time required: between just a couple of minutes and up to half an hour, depending on whether you're content with just a quick impression or whether you want to study all details and have time for some elaborate photography. The Duomo, with its extraordinary and often very dark (even brutally graphic) statues and reliefs, is just a few hundred yards away to the north-west. The nearest top tourist attraction, obviously enough, is the Duomo. And all the museums, art galleries and shopping palaces that surround it.